Prior to a Friday, December 14 application deadline, the CCH Law Project will outreach to homeless students and parents interested in applying to the Chicago Public Schools’ magnet, charter, and selective enrollment schools. Students or parents may also call attorney Alyssa Phillips at 1 (800) 940-1119 or (872) 588-6800 for assistance or to arrange an outreach visit at your school or organization. 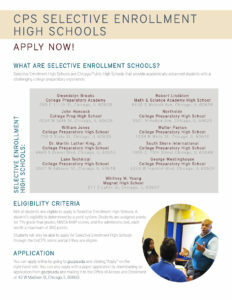 Families and students can apply online at https://go.cps.edu/ Click “Apply” on the right-hand side. A student also can apply with a paper application downloaded from https://go.cps.edu/ and mailing it to the Office of Access and Enrollment at 42 West Madison St., Chicago 60602. Not all students are eligible to apply to selective enrollment high schools. A student’s eligibility is determined by a point system. Students are assigned points for 7th grade final grades, NWEA MAP scores, and the admissions test, each worth a maximum of 300 points. Students will only be able to apply for Selective Enrollment High Schools through the GoCPS online portal if they are eligible. Eligible students who are experiencing homelessness can apply to selective enrollment high schools. This includes families and students living in shelters, sharing the housing of others due to loss of housing or economic hardship (“doubled-up”), or living in other temporary living situations. All eligible students must take an entrance exam. Some selective enrollment high schools have additional requirements, including auditions or portfolio reviews, information sessions, essays, letters of recommendation and interviews. During the online application process, if you choose a selective enrollment high school, you will be asked to select a testing date and location. The next test dates are on Saturdays, on December 1, December 15, and January 19, 2019. The test will be administered at five sites: Lane Tech College Prep High School, Lindblom Math and Science Academy, King College Prep High School, Westinghouse College Prep High School, and Whitney Young Magnet High School. The test is not offered at all sites on all dates. The Law Project recently offered outreach and assistance on the application process at Earle Elementary, Nicholson Technology, Laura S. Ward Elementary, and Sylvia Center.